The Current Week TWAP is the time-weighted average price (TWAP) of a security for the current trading week. The TWAP is an early algorithm that was used by high volume traders to execute large orders over a specified time period. Today it is only used as a benchmark when volume data is not available. The time-weighted average price (TWAP) is an average price that reflects how the asset’s market price has changed over time. The simplest version of a TWAP is based on time slicing. On a time-based chart, such as a minute chart the TWAP is calculated as the arithmetic mean of all data points. On tick-based charts all data points are weighted by the bar duration. Trading algorithms that try to match the TWAP are typically based on a uniform time-based schedule. This approach should only be used with uniform volume or when no volume data is available. The Current Week TWAP can be set to calculate for the entire trading week or it can be set to calculate for custom hours such as the regular session. When a custom session is selected the TWAP calculation will pause outside the selected custom hours. In case that there is a technical break inside the selected session, please select “Technical break in session” and enter start and end time for the technical break. The TWAP further comes with time-weighted standard deviation bands. As the TWAP does not use volume information, it should be set to “Calculate” = “On price change”. 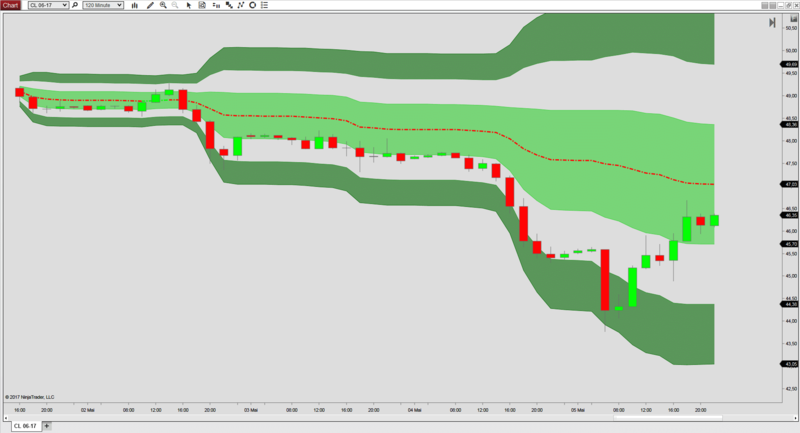 The indicator that can be downloaded here will calculate an accurate TWAP and accurate bands when applied to high resolution charts. When used with higher timeframe charts, the plots may be one or a few ticks off the correct value.